1 reduced salt chicken stock cube, crumbled and added to 250ml boiling water in a jug and stirred. 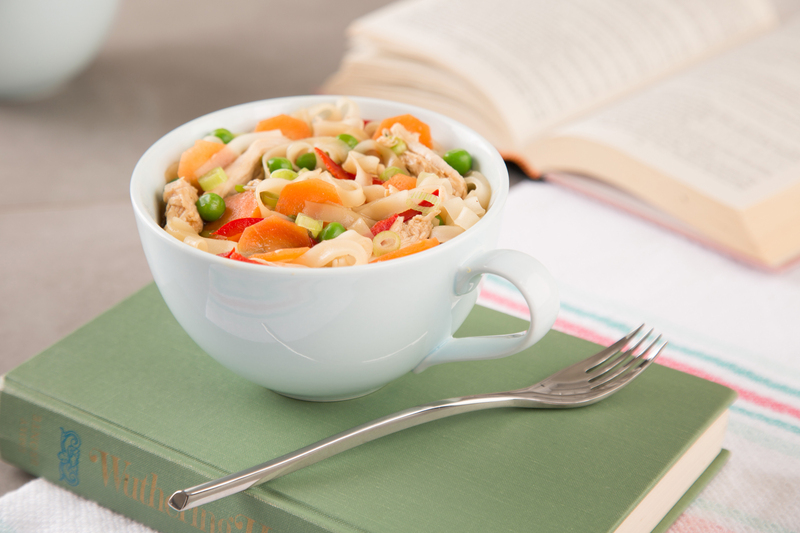 Place the noodles in an individual microwavable soup bowl or large mug then pour hot stock over the noodles and leave for 3 minutes. Add the chicken, carrot, peas, red pepper and spring onion. In a small bowl mix the cornflour, light soy sauce, 5-spice and a 1tbsp cold water. Pour the cornflour mixture over the noodles then mix everything together ensuring that the vegetables are evenly distributed throughout the bowl. Cover the bowl with cling film and microwave on High for 2 minutes, stirring halfway through cooking, until the chicken is piping hot. Leave to stand for 1 minute before serving.